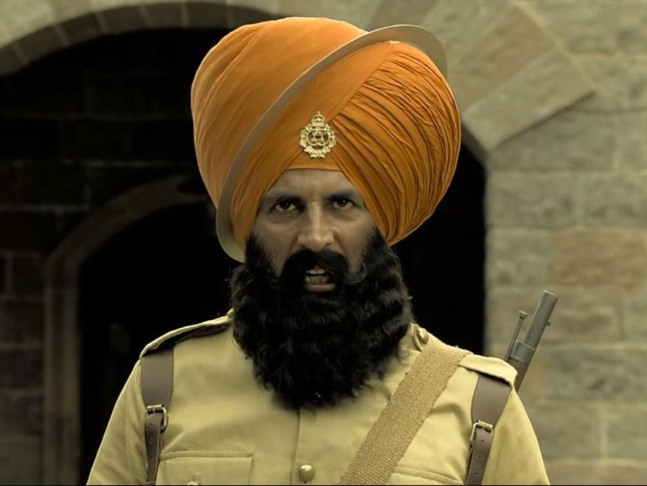 The second song from Kesari, titled Ajj Singh Garjega, will release on March 5 but ahead of it, Akshay Kumar posted a short clip as he “couldn’t stop” himself from singing two lines. In the teaser, Akshay, who stars in the lead role in Kesari, sings Ajj Singh Garjega and he is so, so good. Handsome in an orange tee, Akshay announced that Ajj Singh Garjega will release tomorrow. “The next song from #Kesari, #AjjSinghGarjega is packed with so much power & pride...couldn’t stop myself from singing two lines. Here’s a teaser for you guys, full song out tomorrow by @jazzyb,” Akshay captioned his post. As mentioned by Akshay in the post, Jazzy B has provided vocals to Ajj Singh Garjega but we loved the song in the actor’s voice as well. The internet is thoroughly impressed with Akshay and his vocals to Ajj Singh Garjega and flooded the comments section of his post with praiseworthy words such as, “Powerpacked,” and “Zabardast.” “Woow @akshaykumar sir kya baat hai. Lovely singing,” read another comment on his post. We can’t wait as well. The first song of Kesari, titled Sanu Kehndi, released last week and was an instant hit among fans. Directed by Anurag Singh, Kesari is a war drama based on the Battle of Saragarhi in which an army of 21 Sikhs fought against the Afghans in 1897. Produced by Cape of Good Hope Films and Karan Johar’s Dharma Productions, Kesari, co-starring Parineeti Chopra, is scheduled to release on March 21.